I just started cycling as a way to supplement going to the gym and to enjoy the outdoors. Been riding about a month so far. I'm going about 30 mins/5 miles in the morning before work and twice that on the weekends. I'm riding a Mongoose Maxim, which is a MTB. Before I invest in a new bike I want to see if I stick to it and have an idea of what I like dislike. The rides I take tend to be paved park path or neighborhoods and relatively flat, though I have done short distances on gravel/dirt roads. There are times when I am riding when I wish there were more gears past the 21st. Is that a function of the bike I have (MTB)? I have trouble shifting into the 21st gear. Chain makes clicking noise but has trouble catching. Sometimes takes two or three tries. Do I chalk this up to it being an inexpensive bike? I also can't get the bike much past 15 mph. I pushed really hard and got a brief distance at 18 mph. I assume that is all due to the wide tires, upright riding position, gearing, etc. I'm trying to figure out using gears. I had a 10 speed when I was a kid. Most of the riding I've been doing has been in the 17-21 gear. I'll get it figured out. Mostly that, but also partly due to your short time with the bike and biking in general. Maybe you will. Maybe you will take some kind of introductory course given by a local co-op and shorten the time it takes to 'figure it out' on your own. Bikes: Planet X Carbon Pro Evo SRAM Force, custom built 653 and 531 bikes with frames by Barry Witcomb, Giant XTC 4 mountain bike and a Brompton folding bike. Apart from not getting into top gear I'd say most of what you're experiencing is down to riding a mountain bike. They aren't designed for the sort of terrain you're mostly riding and you'll be able to go a lot faster with something that has higher gears and lower drag tires. When you go for a new bike I'd say one of the most important things to decide is whether you like flat bars or drops. I've been riding drops all my life and my body has definitely adapted - I far prefer them to flat bars - but they aren't for everyone. Once you've decided that you can get a bike more suited to your typical ride. Before long you'll be going further and faster. I'm guessing that your mountain bike has 3 x 7 gears. A typical road or hybrid bike nowadays has 2 x 11. This means you tend to do most of your gear changing on the rear derailleur and only change the front one when you want to go really fast or climb a big hill. It makes changing gear very much simpler. In fact, from what you describe of your ride, I'm guessing you'll be sticking to just one of those two front ratios for all of your ride. Thanks for the input everyone. I really appreciate the help. I have a lot to look forward to. The gears on even and inexpensive bike should work properly if adjusted correctly. I'm not sure what you mean by 21st gear but surmise you mean in the large chainring in the front and the smallest gear in the rear which would be the high gear for your bike. All derailleurs come with stops that prevent the derailleur from moving so far to the left or right that the chain would come off on one side or the other. I suspect that the stop on the rear derailleur is too tight so it doesn't allow the RD to move far enough to the right. You will see two screws side by side on the derailleur body. Often times they are marked L for low or left stop and H for high gear or right stop. If you turn the H screw counterclockwise about 1/4 turn it should make it easier to get into the high gear in the rear. If it gets better but not enough, try another 1/4 turn of the screw. Mountain bikes are geared lower than a road bike because you need those gears for rough terrain and for getting over obstacles. You are using an MTB where a road bike might be more appropriate. The higher gear range on a road bike gives you the potential to go faster (but maybe not depending upon your fitness level). I also can't get the bike much past 15 mph. I pushed really hard and got a brief distance at 18 mph. Many mountain bikes lack very high gears, although this really shouldn't be an issue if you're only ever getting up to 18mph. Probably a combination of inexpensive bike and poor adjustment. It could also be pedaling technique, if you're grinding hard on the pedals at low cadence while trying to shift. What does "pushed really hard" mean? Do you generally mean that you were riding strenuously, or do you mean that you were putting a ton of force on the pedals in a very high gear, turning the cranks slowly? High force on the pedals by itself doesn't deliver power. Force times cadence delivers power. If you want to go fast, push hard on the pedals while spinning them at a spirited rate. Sometimes when I'm in a really high burst of effort, I'll pick a gear where I'm doing about two full crank revolutions every second. and got a brief distance at 18 mph. I assume that is all due to the wide tires, upright riding position, gearing, etc. 1-Fitness and technique of the rider. As said before, MTB gearing usually shouldn't be a hindrance at only 18mph. The fatness of the tires is probably much less of a problem than them being cheap mountain knobbies. There are some fat road tires that roll quite well, but their construction is nothing like that of the tires that came on your Mongoose. I had a 10 speed when I was a kid. If your familiarity is with road bikes, an MTB will definitely feel sluggish on the road. Back in 1997 I bought a hard-tail MTB to commute. The speed was way down compared to the previous bike. So I put a larger big chain ring on the front crank and smooth street tires. 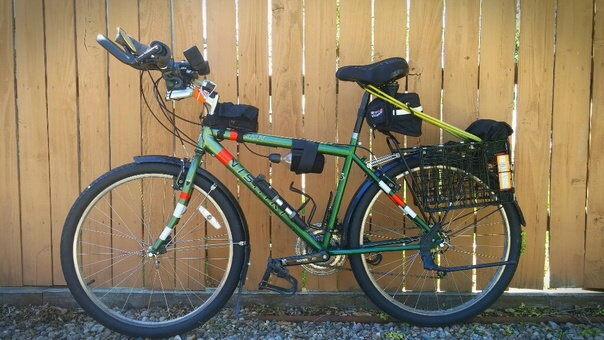 It's now my winter commuter (with snow tires), and utility bike/commuter in the summer. I ended up getting a $60 MTB from craigslist (diamonback Outlook DX frankenstein bike) with some of the things I wanted like a bigger frame, different gearing etc. Still not quite what I have pictured in my mind but helpful to figuring out what I want in the long term. sometimes ,I think my saddle and the crandle have some distance ,which make me uncomfortable .Do you have good suggestion . Go to a bike shop. Talk to sales person about the type of riding you would like to do. Have her/him size you and take a couple out for a quick test ride. Feel the differences compared to WHAT YOU NOW HAVE, not so much between the new bikes, and think about saving up for a new bike purchase if you feel great during and after the rides. Go to a bike shop and tell them you want to try out a fast road bike in your size. I think you'll be amazed at the difference that an 18 lb bike with thin tires makes speedwise, as well as comfort-wise once you're stretched-out on something that fits, and wasn't designed primarily for muddy singletrack trails like MTB's are. uh oh, N+1 strikes again, with hints of a repeat performance ... don't wan to wind up w 3 bikes, that you don't like, do ya?